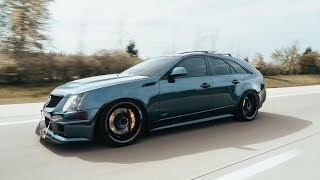 The Cadillac CTS-V Wagon combines the performance and luxury of the landmark Cadillac CTS-V Sport Sedan with the dramatic design of the CTS Wagon. 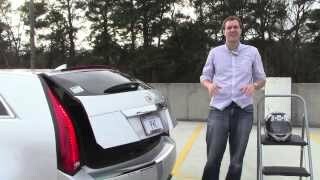 The combination makes for a unique, high-performance Cadillac that hauls in every sense of the word. Like the Sedan model that established the CTS-V legacy, the V-Series Wagon is powered by a supercharged 6.2L V-8 that delivers 556 horsepower (415 kW) and is backed by either a six-speed manual transmission or a six-speed automatic. The CTS-VWagon combines the performance and luxury of the landmark CTS-VSport Sedan with the dramatic design of the CTS Wagon. The combination makes for a unique, high-performance Cadillac that hauls in every sense of the word. 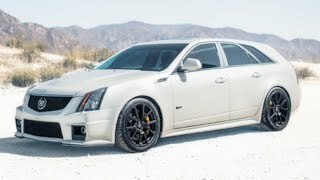 Like the Sedan model that established the CTS-Vlegacy, theV-Series Wagon is powered by a supercharged 6.2L V-8 that delivers 556 horsepower (415 kW) and is backed by either a six-speed manual transmission or a six-speed automatic. A collection of technical and performance elements complement the powertrain, including Magnetic Ride Control, Brembo brakes and Michelin Pilot Sport PS2 performance tires mounted on 19-inch forged aluminum wheels. A unique grille that doubles front-end airflow to help enable its high-performance capabilities is one of theV-Series’ distinguishing features, along with an aggressive front fascia and raised center section of the aluminum hood that provides clearance for the supercharger. The CTS-VWagon rolls into 2012 virtually unchanged, offering only a trio of new exterior colors – Black Diamond Tricoat, Opulent Blue Metallic and Mocha Steel Metallic (late availability on Mocha Steel Metallic) – to complement its well-established performance credentials. Rainsense automatic windshield wipers are added, too. The CTS-VWagon incorporates a number of unique cues that blend function with aesthetics. The dihedral Cadillac grille, for example, is larger to enable more air intake and features a satin finish, while the raised hood encompasses the supercharged engine beneath it. The front and rear fascias, as well as a rear spoiler that houses the center high-mounted stop lamp, are specific to the car, as are its standard 19-inch wheels. TheV-Series Wagon is essentially the same size as the CTS-VSedan on the outside, but its unique cargo compartment nearly doubles carrying capacity, with 25 cubic feet (720 liters) of space behind the rear seats; and 53.4 cubic feet (1,523 liters) with the rear seat folded. High-intensity discharge headlamps with Adaptive Forward Lighting Systemare standard. Heated and power-adjustable outside mirrorsare standard. Rainsense automatic windshield wipersare standard. Nineteen-inch painted aluminum wheelsare standard. Nineteen-inch high-polished aluminum wheelsare optional. Nineteen-inch aluminum wheels with satin graphite finishare optional. Exterior color choicesinclude: Radiant Silver Metallic, Black Raven, Black Diamond Tricoat, Crystal Red Tintcoat, White Diamond Tricoat, Thunder Gray ChromaFlair, Opulent Blue Metallic and Mocha Steel Metallic (late availability). The interior of the CTS-VWagon features streamlined instrumentation, LED lighting and hand-cut-and-sewn accents. It includes performance seats featuring perforated sueded microfiber inserts designed to hold the driver and front passenger in place during cornering. Recaro performance driving seats are optional and provide excellent support during performance driving. These 14-way adjustable performance seats include pneumatic bolster controls in the seat cushions and backrests. Complementing the performance seating are a thick steering wheel and a gauge package designed for easy, at-a-glance reference during performance driving. Large instruments have bold readouts, including an LED-lit “tracer” function in the tachometer that flashes as the engine nears the red line. The gauge layout includes a boost gauge and a lateral acceleration display. Obsidian Black accents grace the center stack, console, steering wheel and door panels. The production steering wheel and shifter are available in Alcantara, providing the luxurious character of suede. Audio system with navigation, including AM/FM stereo, CD/DVD player, MP3 playback, Bose 5.1 Cabin Surround Sound with 10 speakers, 40-gig hard drive and USB with audio connectivity is standard. SiriusXM Satellite Radiowith three-month trial service is standard. Dual-zone automatic climate controlis standard. Keyless entry and keyless start featuresare standard. Auto-dimming inside mirror with OnStar controlsis standard on all models. Ultrasonic rear park assistis standard. Front bucket seats with power eight-way driver’s adjustment and articulating head restraintsare standard on all trim levels. Recaro performance seatsare optional and include heated/cooled feature and leather trim with microfiber suede inserts. Steering column with power-adjustable rake and telescopic featureis standard. Leather-trimmed steering wheel with auxiliary controlsis standard and includes paddle-shift controls when the vehicle is equipped with the automatic transmission. Steering wheel with microfiber-trimmed rimis available and is packaged with microfiber-trimmed shift knob and Recaro performance seats. Interior color and trim choicesinclude: Ebony seats with Ebony microfiber suede inserts and Light Titanium seats with Light Titanium microfiber suede inserts. 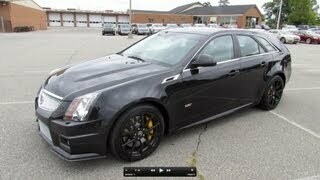 The CTS-VWagon’s 6.2L supercharged V-8 engine is rated at 556 horsepower (415 kW) and 551 lb.-ft. of torque (747 Nm). It is the most powerful engine in Cadillac’s history. The engine features an intercooled Eaton Twin Vortices Series™ (TVS™) supercharger, which employs twin four-lobe rotors that are twisted 160 degrees. Typical superchargers feature three lobes twisted 60 degrees. The fourth lobe and greater helix profile, when combined with unique air inlet and outlet ports, create smoother, more efficient airflow into the engine. In addition to improved overall efficiency, this supercharger has superior noise and vibration characteristics compared to more ordinary designs. A pair of six-speed transmissions is offered in the CTS-VWagon – a Tremec TR6060 six-speed manual with a dual-disc clutch and a Hydra-Matic 6L90 six-speed automatic with steering wheel-mounted shift controls. The steering wheel-mounted controls require no shift lever movement and allow immediate tap up/tap down gear selection. Performance Algorithm Shifting provides the automotive transmission with a performance-oriented shift pattern during sustained high-performance driving. As with many Cadillac models, the driver needs only to slide the shifter into the manual “gate” to put the transmission into a performance mode. TheV-Series is designed for great road-holding performance, while maintaining the poise of a luxury car in average driving conditions. This is enabled by Cadillac’s landmark Magnetic Ride Control, the world’s fastest-reacting suspension technology. It uses shocks controlled by advanced magneto-rheological technology, rather than mechanical valves, to greatly accelerate response time and precision. Electronic sensors at all four wheels literally “read the road” every millisecond, making constant adjustments to damping to create virtually instantaneous and extremely precise control of body motions. The Magnetic Ride shocks also enable a broader range of damping control to optimize the ride and handling for all driving conditions. In the CTS-V, an extra measure of control is offered, with two selectable modes (Tour and Sport), enabling the driver to tailor the suspension for grand touring or more spirited performance driving. The CTS-Valso incorporates sophisticated braking and tire systems, in partnership with two companies renowned for high-performance technology: Brembo and Michelin. Brembo brakes are at all four corners and include powerful, six-piston calipers in the front and four-piston calipers in the rear. Large, vented rotors enable strong initial braking force while optimizing heat resistance and eliminating fade. The brake rotors from Brembo are manufactured with “dual-cast” technology that combines cast iron and aluminum, resulting in superior performance and weight reduction. Michelin partnered with Cadillac engineers to develop an exclusive Pilot Sport PS2 tire specifically engineered for the CTS-VWagon. The tires support high levels of grip in track conditions, while also affording excellent performance on the road. An independent short/long arm (SLA) front suspension systemthat features low-mass aluminum for the upper and lower control arms, as well as the knuckles. A multi-link rear suspension with a fully isolated subframe. StabiliTrak electronic chassis control systemis integrated with the car’s standard four-channel ABS with the full-function traction control, as well as the hydraulic brake assist and engine control systems. A 3.73 axle ratioon manual-transmission models. A 3.23 axle ratioon automatic-transmission models. A power-assisted rack-and-pinion steering system. Dual-stage driver front air bag. Segment-first dual depth front passenger air bag. Driver and front passenger side seat-mounted pelvic/thorax side air bags. Roof-rail side curtain air bags with rollover protection technologythat cover front and rear seating rows. Body structure with strategically placed high-strength steel. Active head restraints for front seat occupants. OnStar is standard on the CTS-VWagon. It uses GPS and cellular phone technology to automatically call for help in the event of crash. OnStar subscribers also can use the service to be Good Samaritans by sending help to other motorists, and to call for help in other non-crash emergencies. OnStar is the leading providerof in-vehicle safety, security and information services in the United States and Canada. One year of complimentary OnStar Directions and Connectionsservice with Turn-by-Turn Navigation for easier route guidance on all CTS models. The feature is easy to use because alldirections are sent to the car by an advisor, without the need to stop.Turn-by-Turn can be cost-effective, since map updates and aftermarket navigation systems are not needed. Stolen Vehicle Assistancehelps police track the vehicle. myCadillac and OnStar myLink mobile appsoffer vehicle information and OnStar services via the customer’s smartphone.